Bloomberg’s Fercan Yalinkilic points out that Turkish government bonds are also weakening, pushing up the yield (interest rate) on the debt. That’s another indication that the markets are getting jittery about the impact of Ankara’s speculation crackdown on the economy. Stocks are plunging in Turkey today as the country’s currency crisis threatens to explode again. The BIST 100 index, which tracks Turkey’s biggest companies, has fallen 5% — amid a rush to sell stocks. But… the bigger drama is actually in the foreign exchange market, where the Turkish government is imposing a crackdown on speculators targeting the lira, by making it extremely hard to borrow the currency. This has sent the cost of borrowing Turkish lira overnight soaring through the roof. My Reuters terminal is flashing that the offshore overnight swap rate, the cost to investors of exchanging foreign currency for lira, has hit a scarcely believable 1,000% (per annum, I think). That means that it’s simply impossible for some traders to short the lira (borrow it, sell it, then buy it back cheaper). This is also forcing some investors to liquidate their Turkey assets to get their hands on lira, forcing share prices sharply lower. This crackdown is designed to prop up the lira, which has been wobbling alarmingly since Friday. Turkey’s economy is weak, falling into recession this month following Ankara’s efforts to squeeze inflation and support its currency last year. Overnight swap implied yield hit 1000%#Turkey stocks are taking a nosedive of 4.4% as foreigners starved for #lira are unloading. The CBI splits UK retail into 13 subsectors — five reported falling sales this month, while the rest are flat. The CBI explains how grocery sales weakened, pulling overall retail sales down. Grocers have been the biggest positive driver of headline sales growth in the past two months, however sales in the sub-sector were flat on a year ago in March, pulling total retail sales into the red. Retail suppliers also told the CBI that orders are down this month. Newsflash: UK retail sales are falling at the fastest pace in 17 months, which may intensify concerns that Brexit is spooking consumers. That’s according to the CBI, which represents Britain’s bosses. Its new ‘distributive trades’ survey has found that many retailers are finding March tougher than a year ago. The CBI says that 28% of respondents reported that sales volumes were up on a year ago in March, while 46% said they were down, giving a balance of -18%. That’s the biggest contraction since October 2017, 17 months ago. However….it’s worth noting that Easter is later this year, which may be affecting sales. Also, the CBI only tracks 105 companies (of whom 50 are retailers), so it’s not an exhaustive report. “Even accounting for Easter timing, the High Street’s poor run continues. While real wage growth is picking up, consumer confidence has been hit by escalating uncertainty over Brexit and concern over the economy’s future. 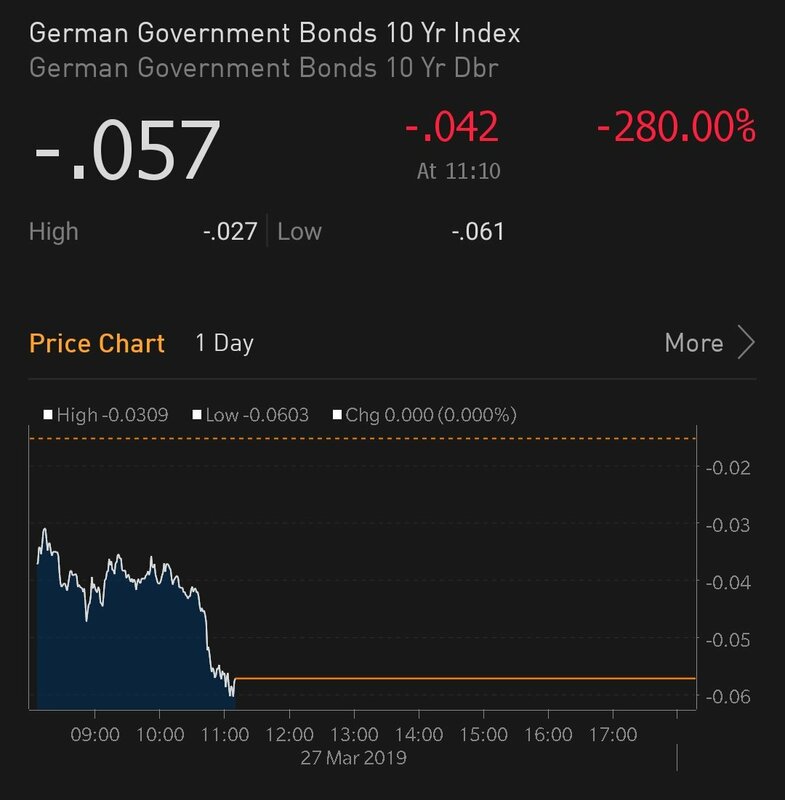 Newsflash: Germany has sold 10-year government debt at a negative yield, for the first time since 2016. That means investors have paid slightly more than the face value of the bond, meaning they’ll make a small loss if they hold it until it matures in 2029. In total, the German Finance Agency sold €2.433bn of 10-year bunds at an average yield (or interest rate) of minus 0.05%. They received €6.31bn of offers, allowing them to pick the lowest bids. It suggests that investors are more gloomy about economic prospects this year, and trying to put their money in a safe-haven asset such as German debt (Germany being particularly unlikely to default over the next decade). 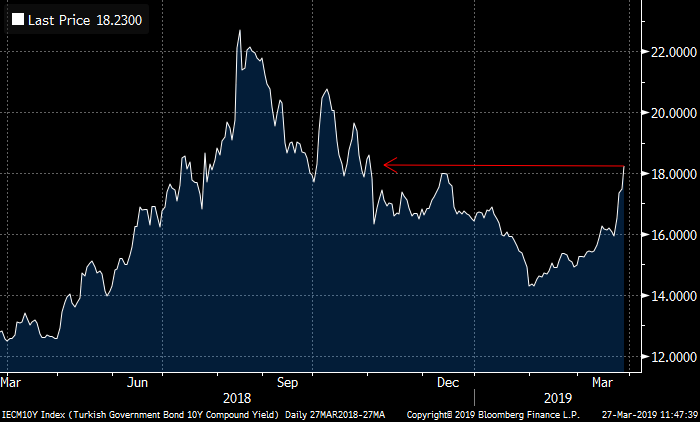 It follows a similar move in US government bonds in recent days – where falling yields have ignited concerns of an American recession in 2019 or 2020. It’s also a response to ECB president Mario Draghi’s pledge today to take fresh action if necessary to stimulate the eurozone economy. European stock markets have dipped this morning, as investors get to gips with the latest pessimistic noises from central bankers. New Zealand’s surprise move towards an interest rate cut, and Mario Draghi’s less surprising concern about the eurozone economy, has dampened the mood. The main European stock indices are all in the red, with the FTSE 100 shedding 18 points or 0.25%. Global equities traded mixed overnight as investors deal with some disappointing economic signals this month, along with a plethora of central banks decisively turning towards accommodation, shying away from rate normalization for the foreseeable future. A number of sovereign yields have plummeted to new year lows while risk aversion trading strategies have tended to dominate proceedings as U.S/China trade talks (Mar 28/29) remain a focus along with U.Ks Brexit next steps. U.S recessions fears are being stoked by the inversion of U.S three-month bill rates and the benchmark U.S 10-year note curve. Not everyone is convinced by Draghi’s claim that the ECB has plenty of tools at its disposal to fight the next downturn. 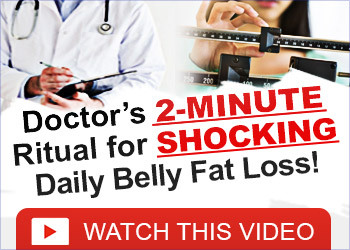 Sure, it can leave interest rates at record low levels for even longer. It can launch new TLTRO programmes to stimulate bank lending. It could even (I guess) restart its asset purchase scheme programme, or keep delaying the moment when it starts to unwind its existing QE. But at some stage, maybe it must admit that governments should pick up the baton, and use tax and spending policies more wisely to spur growth…. Rupert Harrison of BlackRock is sceptical…. Economist Tony Yates also believes the ECB’s tools are limited. Overnight, we’ve received fresh evidence that China’s economy is weakening. Beijing reported that industrial profits have slumped by 14% year-on-year in February, suggesting that the economic slowdown and the trade war with America is hurting factories. Draghi also offered a crumb of comfort to eurozone banks. He says the ECB is monitoring the impact of negative interest rates on their profits, and could take measures to help. Our monetary policy will remain accommodative and will respond to any changes in the inflation outlook. The effects of exchange rate appreciation have now reversed. Demand should recover, so long as the downside risks to our outlook do not materialise. And with stronger demand, firms should be able to rebuild margins. But if conditions deteriorate, president Draghi vows to act…. The ECB will adopt all the monetary policy actions that are necessary and proportionate to achieve its objective. We are not short of instruments to deliver on our mandate. Mario Draghi goes on to warn that the risks to the eurozone economy have risen in recent months, due to problems in the global economy. He points out that new export orders are still in negative territory, suggesting Eurozone factories are struggling. But….he hopes that the current “soft patch” will not turn into a serious slump. All in all, the current data suggest that external demand has not yet spilled over significantly into domestic demand, but the risks have risen in the last months and uncertainty remains high. This is why our medium-term outlook remains that growth will gradually return to potential, but the risks remain tilted to the downside.